Taste test: These kettle-style potato chips had a ton of sweet onion seasoning on them, and they were very crunchy but generally not all that crisp. The onion seasoning seemed good at first, but after a while I realized that it was a very, very sweet, even sugary onion taste, not really bad but probably too sweet. 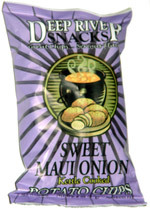 A decent kettle-cooked chip, and many of our tasters liked these a lot. Smell test: Not much at all. Maybe the slightest onion smell.